“This is us,” joked our tour leader, Chantal, as the transfer coach approached the dock in Valletta. A vast, slab-sided ship loomed ahead, all 14 decks of it. There was rumbling on the bus, and then nervous laughter as tiny Hebridean Sky peeped out from behind its neighbour. These were Noble Caledonia passengers. They don’t do big ships. We trooped up the gangway. There was no check-in as such, no handing over a credit card, just the important business of collecting a cabin key and a glass of Pimm’s, and getting stuck into the array of dainty cakes and sandwiches thoughtfully laid out in the Lounge to welcome us. I was immediately enchanted by this pretty little 118-passenger ship, which underwent a multimillion-pound refit in early 2016 to bring it up to the standard of its sisters, Island Sky and Caledonian Sky. The whole vessel is understated and traditional, all teak decking, wood-panelled corridors and shiny brass fittings. And with her dark blue hull, white superstructure and elegantly raked aft decks, Hebridean Sky didn’t look out of place next to the mega-yachts we encountered on our week-long tour round Sicily. Our itinerary was distinctly upmarket too. We were accompanied by singers from the London Festival Opera, and there would be recitals during the week. Led by artistic director Philip Blake-Jones, who has sung with Glyndebourne and the D’Oyly Carte, the musicians spent the whole week with us, joining the tours and mingling at mealtimes. Many of my fellow passengers had come just for this, and would clearly follow the LFO to the ends of the earth, regardless of itinerary. 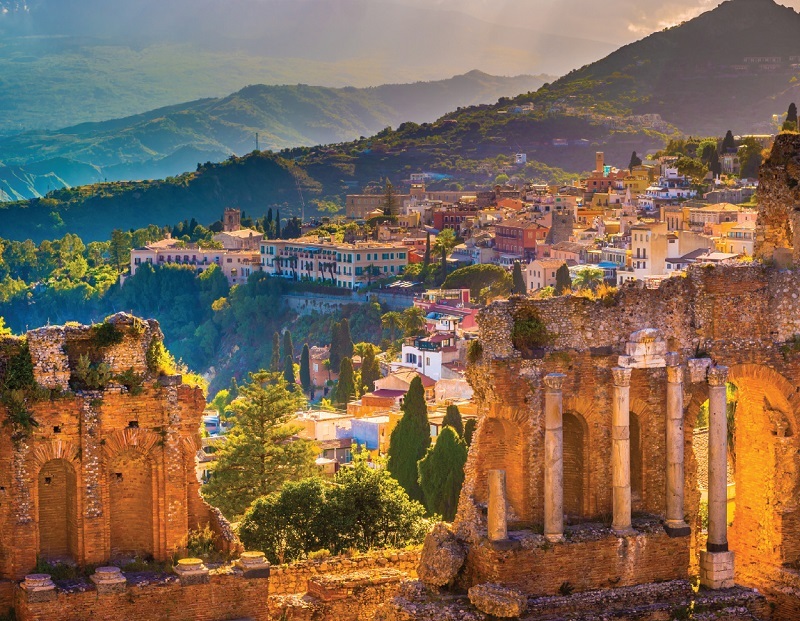 Others were on board for the world-class archaeology that any round-Sicily cruise promises. Neither group was to be disappointed. Because all the excursions are included in the price, there’s a certain expectation that you’ll turn up for them, and we were all on parade by 8.15 most mornings. A visit to the Villa Romana del Casale was one of the most impressive: the mosaics at this former Roman hunting lodge are simply amazing. Who knew that Roman girls wore bikinis and played volleyball? Not me – until I saw the famous floor depicting scenes from a pentathlon, 2,200 years ago. Our tour was followed by lunch in a wonderful winery high in the hills, where we enjoyed exquisite Sicilian tapas, the grower’s own whites and reds, and a rich tomato pasta. Back on board, social life revolved around the Club, a cosy lounge/bar that adjoins a gorgeous, spacious, light-filled library; the Lounge, where talks and concerts are held; the Restaurant; and the Lido, a big, open-air dining deck. The food was uniformly excellent and very much aimed at British tastes, with Marmite and baked beans on the breakfast menu; scones, clotted cream and Twining’s tea in the afternoons; and a traditional Sunday roast. 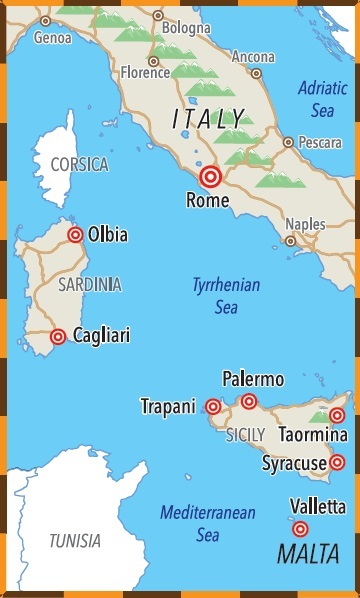 Not that local flavours were neglected: in Taormina we made complete pigs of ourselves scoffing rich cannoli (pastry cigars filled with a luscious cream-and-ricotta mixture), and on another day the Lido did a roaring trade when a mountain of fresh oysters was produced at lunchtime. I was delighted to find there was a regular “catch of the day”, made possible because the ship is small enough for the chefs to go ashore and shop in local markets. There was no shortage of grazing food, either – from the cookie jars by the cappuccino machine in the Club to the generous array of hot canapés that appeared every night in the Lounge before the Cruise Director’s briefing. Wine was included with lunch and dinner, which made for a sociable atmosphere (and a much reduced bar bill at the end of the cruise). There was plenty of choice, too. The house rosé was a rather sickly Californian Zinfandel, but the maître d’, having spotted my despair, magicked up several bottles of a fine, dry Sicilian that was served for the rest of the week. The Restaurant does have tables for two, but with such a sociable and jolly atmosphere, most passengers chose to mingle. One lady travelling alone told me how much she liked the open seating. “I can’t think of anything worse than being stuck with a bunch of other widows,” she said. Many of my fellow guests were well travelled Noble Caledonia devotees (it’s not unusual on these voyages for 70 per cent to be repeaters). Most were over 60 and understatedly posh: I shared tables with a nonagenarian doctor; an ex-RAF pilot; a haematologist who specialised in tropical diseases; a lady who bred racehorses; and several retired lawyers. We ate on deck as much as possible, hardly ever needing the fleecy blankets that were piled up in the Lido. But despite the long, convivial dinners, there was very little nightlife. A few people would repair to the Club for a digestif but most turned in after dinner, anticipating another early start. The exception was the opera nights. There were three concerts by the LFO, two ashore and one on board, and they were real extravaganzas. After an early dinner in Syracuse, we trooped ashore to the magnificent Palazzo Beneventano del Bosco for a recital in a romantic courtyard, under a star-studded sky. Afterwards, the prosecco flowed and those who had not eaten enough at dinner satisfied themselves at a lavish buffet. In Palermo, the Palazzo Valguarnera-Gangi provided an even more dramatic setting, with the singers in 19th-century costume against a backdrop of gilded baroque magnificence, with the Principessa herself in attendance and drinks on a beautiful terrace after the recital. No matter how splendid the evening, returning to our ship was always a pleasure. She may be small but the guest accommodation – as on Noble’s other ships – is huge. More like hotel rooms, Hebridean’s cabins are beautifully decorated, with sumptuous fabrics in olive and gold. Mine had a smart, travertine-lined bathroom with generously sized bottles of Molton Brown goodies, a rainforest shower and a walk-in wardrobe. Storage was super-generous, with more than 20 drawers. But it puzzled me why each drawer unit had small holes in the top. It turned out these are for Antarctica, where this ship spends her winters. The notorious Drake Passage gets so rough that you have to slide rods down through each unit to stop the drawers flying open. Luckily, although we had one bumpy night, the Mediterranean in October was considerably kinder. Unlike my cabin on Byrd Deck, those on Scott and Shackleton (they’re all named after polar explorers) have private balconies. But this itinerary included so much time ashore that I barely felt the lack. If there is anything missing from Hebridean Sky, I’d say it’s a small pool or hot tub – although the latter was apparently tried on one of her sister ships and barely used. Otherwise, you happily accept the limitations that come with small size. There are tables and chairs on deck but just one circular lounger, which was always occupied. A tiny sunbathing area with rattan loungers is hidden away on the upper deck, but this is not the prettiest space on the ship (much of it is given over to the Zodiac inflatables that are used in Antarctica, and which we’d hoped to try out in Giardini Naxos, though it proved too choppy to drop anchor). None of this seemed to matter to my fellow passengers, who were perfectly happy sitting in the sun in the Lido, or chatting in the Club, or reading and snoozing in the Library. Saying goodbye at the end of the week was hard. 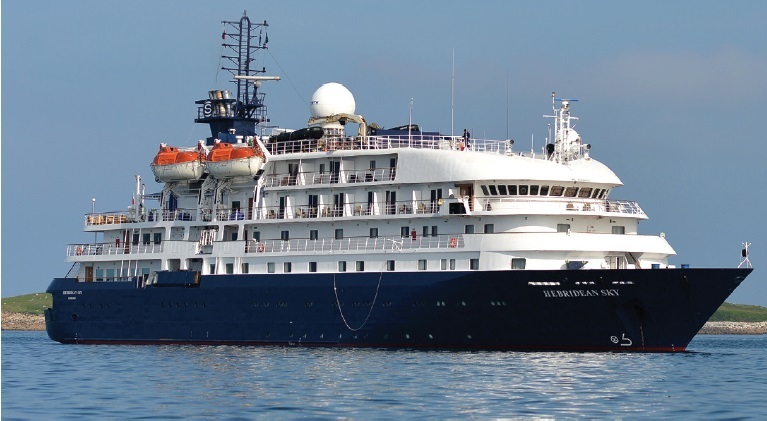 There’s a genuine feeling on board Hebridean Sky that you’re being cared for – by the friendly Filipino crew; by the three spectacularly efficient tour leaders, Wendy, Chantal and Sue; and by Neil, the highly entertaining Cruise Director, who has moved to Noble Caledonia from Saga and has developed a cult following of his own. If you’re looking for nightlife, a fancy spa and West End razzle-dazzle, this won’t be the ship for you. But if you like the sound of a jolly house party with a generous dash of culture, you can’t go wrong. 10 nights from Venice to Dubrovnik with Noble Caledonia and London Festival Opera, departing 21 October 2017. Highlights include a candlelit opera recital at Palazzo Zen in Venice. Prices from £3,925 per person. A week on the CroisiEurope ship Belle de Cadix, which acts as a ﬂoating hotel in the heart of Seville, from 23 November 2017. The holiday includes trips out to the “pueblos blancos” of Andalucia and the sherry city of Jerez, with several recitals by London Festival Opera in the evenings. Prices from £1,895 per person. A 12-night river cruise from St Petersburg to Moscow aboard MS Volga Dream, departing 11 September 2018. As well as a very comprehensive tour programme, this voyage includes three concerts: two well-known opera classics and a costumed gala featuring highlights from Tchaikovsky’s Eugene Onegin as well as songs by Rachmaninov and Shostakovich. Prices from £4,495 per person. 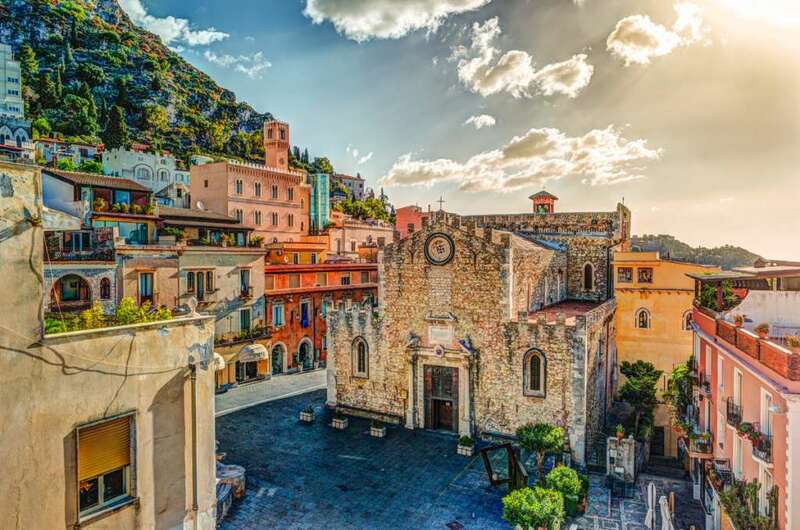 A six-night voyage to Malaga aboard Hebridean Sky (not accompanied by London Festival Opera), including Sardinia and the Balearic Islands, departing 2 October 2017. Prices from £2,295 per person.